One of the challenges at Scrapbooker's Anonymous this month is to use the letter "C" to inspire. I've used lots of Crate Paper Farmhouse collection, fabric covered Chipboard letters, a Crochet theme, and some actual Crocheted embellishment. I was a crochet fiend for years making almost all my gifts for friends and family during high school and college. I learned to knit, too but my stitches were never as even as crochet. While I don't regularly crochet anymore, I have found that my hands will tolerate just a bit like the scalloped border here. I keep a neutral color of crochet cotton and then use ink to dye the finished product to suit the page. In this case, I dyed it in Riding Hood Red classic ink from Stampin' Up! I really miss crocheting particularly now that it is so popular again and there are so many beautiful yarns. It was a great hobby to do in front of the TV. I've been coloring some stamped images instead. Lovely page, I just love the Crate Paper! Way to make use of the letter "C"! I tried to teach myself to crochet, buy my stitches are never as good as my knitting, just the opposite of you. I suppose that's because I learned to knit at a child (my grandmother taught me). I'm thrilled to see both knitting and crocheting becoming popular again! Fabulous LO!!! I am determined to learn how to either knit or crochet. I am going to take a class because I just can't seem to teach myself. LOL!! Thank you for playing along with Artful Delight!! 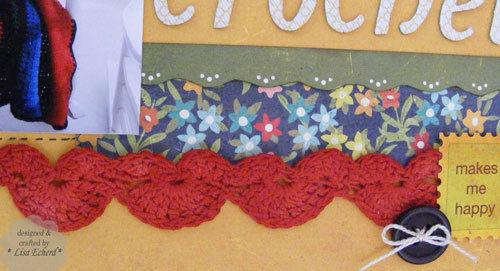 I love your crochet border, this is such a fantastic LO. I too enjoy both knitting and crochet. Lovely layout! 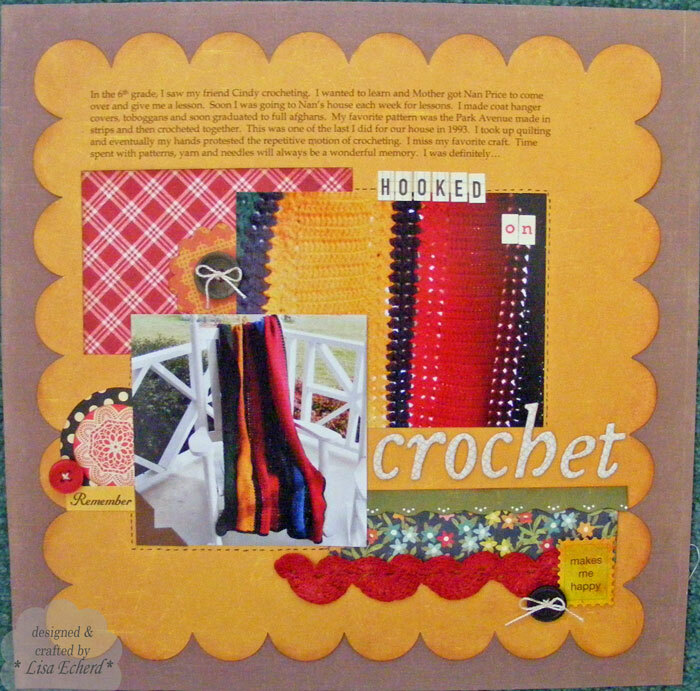 I love all your "C" products including your crocheting. So glad you played along with us at Scrapbookers Anonymous! That is such a fun layout! Oh I just love the colors you've used! What a beautiful blanket and I love the journaling! Great take on our "C" challenge! Thanks for joining in the fun at Scrapbookers Anonymous!!! Great layout! Love the vibrant colours! Thanks so much for playing along with Scrapbookers Anonymous!! I love this! Thought I recognised some of the patterns - Crate Farmhouse, of course :) Love those papers! Beautiful layout! I love the vibrant colours and the crocheted border is just brilliant.